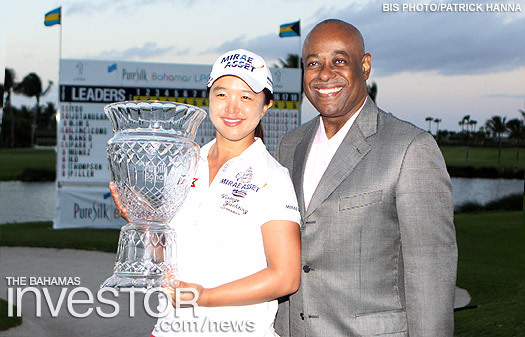 Rookie Sei Young Kim, 22, of Korea emerged the winner of the Pure Silk-Bahamas LPGA Classic, as Bahamas secures the opportunity to host the event for the next three years. 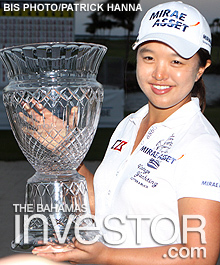 Rookie Sei Young Kim, 22, of Korea emerged the winner of the Pure Silk-Bahamas LPGA Classic, earning her the trophy and a $195,000 cheque. Minister of Tourism Obie Wilchcombe pledged to continue the relationship with the Ladies Professional Golf Association in hosting the annual Pure Silk-Bahamas LPGA Classic over the next three years. He made the announcement during the closing ceremony of the tournament held at the Ocean Club Golf Course yesterday. Government representatives and entrepreneurs gathered yesterday to discuss investment and trade opportunities between The Bahamas and Panama in a push to build trade relations between the two nations. Prime Minister Perry Christie, Minister of Financial Services Hope Strachan and Minister for Foreign Affairs and Immigration Fred Mitchell were among the speakers at the International Business and Finance Summit held on Grand Bahama last weekend.